Global Self Storage, Inc. (Ticker: SELF) (“Global Self Storage” or the “Company”) is a self-administered and self-managed real estate investment trust (“REIT”) that owns, operates, manages, acquires, develops and redevelops self storage properties and provides third-party management services to self storage property owners in the United States. Our properties are designed to offer affordable, easily accessible and secure storage space for residential and commercial customers. The Company currently owns and operates, through its wholly owned subsidiaries, eleven self storage properties located in New York, Connecticut, Pennsylvania, Illinois, Indiana, Ohio and South Carolina. The Company’s common stock is listed on NASDAQ under the symbol “SELF”. At Global Self Storage, our motto is “Security is Our First Priority”. Our goal is to offer the cleanest, safest, and most secure storage solutions for all of our customers. Global Self Storage’s sophisticated and innovative self storage platform has generated peer leading revenue and net operating income growth and can generate the same proven results for your self storage property. Why Choose Global Self Storage? 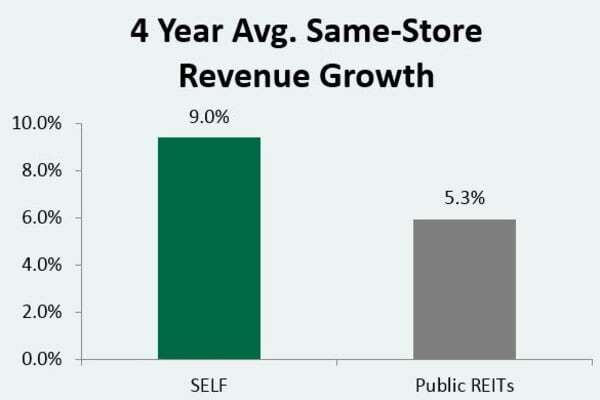 We’ve demonstrated a near 370 basis point Same-Store Revenue Growth outperformance in comparison to the average of our peers (Public Storage, Extra Space, Life Storage, National Storage Affiliates, and Cubesmart) over the 2015 - 2018 years. Note: Based on information obtained in 2015 -2018 reports on Form 10-K filed with the SEC by public self storage REITs (PSA, EXR, LSI, NSA, and CUBE). 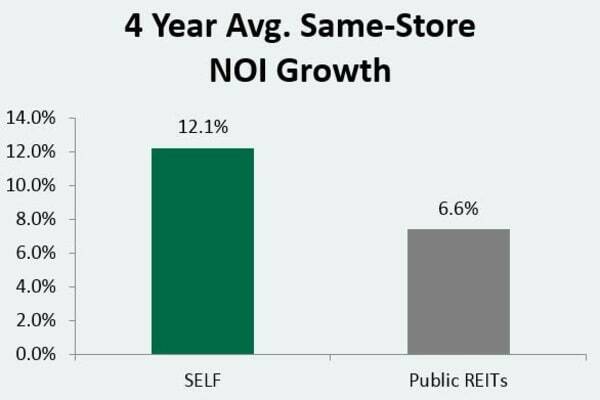 We’ve demonstrated a near 550 basis point Net Operating Income (NOI) outperformance in comparison to the average of our peers (Public Storage, Extra Space, Life Storage, National Storage Affiliates, and Cubesmart) over the 2015 - 2018 years. This performance speaks volumes about our philosophy: It shows that we have formulated a winning strategy and have demonstrated its successful execution. It also shows our consistency, year over year. This performance stems from our entire team—from marketing to operations—along with our industry-leading platform. In seeking to maximize the performance of our properties, we employ our proprietary revenue rate management systems which help us to analyze, adjust, and set our move-in and existing tenant rental rates on a real-time basis across our portfolio. Among other technologies, we employ internet data scraping of our local competitors’ move-in rental rates to help enable us to proactively respond and take advantage of changing market conditions across our portfolio. We have registered the trademark and developed the brand “Global Self Storage.” We have developed a corporate logo and have incorporated it on all of our on-site signage, advertising and other marketing materials. This branding process has included the creation and development of the www.GlobalSelfStorage.us website, whereby prospective customers can rent a storage unit or learn about the features of any of our properties in their various locations. We continue to develop the Global Self Storage internet presence through advertising and search engine optimization. Attracting high quality, long-term tenants is a top priority for us and we strongly believe in tenant quality over tenant quantity. In our marketing efforts, we have seen success in our referral marketing program, through which our tenants may recommend Global Self Storage to their family, friends, and colleagues. As part of our initiative to build a higher quality overall tenant base we often target our promotions to credit card paying customers. We also believe our property managers’ attention to detail – maintaining security, cleanliness, and attentive customer service – is essential to attracting high quality tenants. Each of our properties features a rental and payment center kiosk available 24 hours a day, seven days a week, where prospective tenants can rent a unit and current tenants can pay their rent. All of our properties have on-site property managers who are committed to delivering the finest customer service. We utilize a customer call center to handle telephone inquiries from current and prospective tenants whenever our store managers are not available. We seek to deliver convenience and high-quality customer service to our tenants, as well as maintain clean and secure properties at all times.